At Redbooth, we develop professional software for thousands of global organizations. Many of our customers are in the legal, financial services, healthcare and government sectors. Over a million users and thousands of companies worldwide trust Redbooth to communicate and collaborate securely and in real time. The privacy and security of your data is our main concern, and an area of significant, ongoing investment across the company. Our product was designed from the ground for easy setup and use, with the feel of a “consumer” application, but with the security and control of an enterprise business application. We’ve built sophisticated security infrastructure to allow account administrators to confidently deploy and use Redbooth and focus on getting business value, not on managing security. Our easy-to-use interfaces are backed by infrastructure working behind the scenes to ensure fast, reliable uploads, downloads, sync, and sharing. To make this happen, we’re continually evolving our product and architecture to speed data transfer, improve reliability, and adjust to changes in the environment. In this section, we’ll explain how data is transferred, stored, and processed securely. Redbooth is designed with multiple layers of protection, covering data transfer, encryption, network configuration, and application-level controls, all distributed across a scalable, secure infrastructure. Redbooth users can access files and folders at any time from the desktop, web, and mobile clients, or through third-party applications connected to Redbooth. All of these clients connect to secure servers for access to files, allow file sharing with others, and update linked devices when files are added, changed, or deleted. Redbooth’s secure cloud collaboration platform is hosted by Amazon Web Services in a highly secure, fully-redundant data center which has achieved PCI DSS Level 1, ISO 27001 certification and has successfully completed multiple SAS70 Type II audits. Data at rest is stored in Amazon S3 and AWS RDS mysql database is inside a Virtual Private Cloud, which has very tightly controlled access via a gateway machine. Redbooth servers and data are monitored 24x7 for up-time, availability and intrusion detection. Redbooth’s provider stands behind a 99.99% SLA. The AWS network provides significant protection against traditional network security issues: packet sniffing by other tenants, Denial of Service (DDoS) attacks, Man-In-the Middle (MITM) attacks and use of Web Application Firewalls (WAF). To use Redbooth, you'll need to create an account, either via Redbooth or through your account with a third-party service such as Google. In the latter case, your Redbooth account will be created using the information you provided to that service, such as your name and email address and other personal information that your privacy settings on that service permit us to access. Passwords are hashed using SHA2 and salted several times to defend against dictionary attacks. Physical access to our servers is strictly controlled and all precautions are taken including: power redundancy, temperature control and fire detection. Amazon data centers are surrounded by three physical layers of security. The outermost, or “perimeter one” is a fence which is either crash-rated to prevent a vehicle from penetrating it or backed by the state of the art aka Jersey Barriers. Access to “perimeter two,” an area which houses chillers, switchboards and generators, is blocked by another wall. Entrance requires both a badge swipe and a personal pin. The only authorized entrants are the engineers required to service this sort of gear. Each door is under video surveillance with the feed monitored both locally and remotely. The space between perimeters is studded with internal trip-lights that are also monitored and managed around the clock. The innermost perimeter comprises the data halls with servers and networking gear. These doors are monitored by video cameras and require another badge swipe and pin number for entry. They are also equipped with metal detectors. Redbooth data always travels over a secure connection. It is encrypted for transfer using SSL and it is only accessible via https (never via http). Passwords are stored with one-way encryption on our servers meaning that our own internal team can never access a password. Connections are encrypted with SHA2 2048-bit (TLS 1.2) encryption, the very same high-security standard used in online banking. Redbooth is designed from the ground up to provide a private and secure environment for each user. Each user builds a private workspace which may only be accessed by explicitly invited users. Redbooth tightly segregates the data for each group of users so it is not available to non-members of the group. Organizations and Workspaces, and can be easily removed anytime. Typically, an Organization is used for a company. As shown in the example below: “Redbooth” is the organization. Workspaces are used to create a discrete area for collaboration and can only be accessed by members of the specific workspace. Redbooth’s role-based permission offers 2 different access levels, Administrator, which has the ability to add/remove users or User, which has access, but cannot add or remove users. There are many different compliance standards and regulations that may apply to your organization. Our approach is to combine the most accepted standards — like ISO 27001 and SOC 2 — with compliance measures geared to the specific needs of our customers’ businesses or industries. Our data centers, and our managed service provider undergo regular third-party audits. ISO 27001 – Our datacenter is ISO 27001 certified (published certificate) under the International Organization for Standardization (ISO) 27001 standard. ISO 27001 is a widely-adopted global security standard that outlines the requirements for information security management systems. It provides a systematic approach to managing company and customer information that’s based on periodic risk assessments. In order to achieve the certification, a company must show it has a systematic and ongoing approach to managing information security risks that affect the confidentiality, integrity, and availability of company and customer information. Our datacenter is under a formal program to maintain the certification. This certification reinforces our commitment to providing transparency into our security controls and practices. We collect and store the text, information, tasks and files you upload or access with the Redbooth Service. When you access Redbooth, we may automatically record information from your device, its software, and your activity using the service. This may include your device’s IP address, browser type, the web page visited before you came to our website, location, locale preferences, date and time stamps and other metadata concerning your interactions with the service. We use “cookies” to collect information and improve our services. A cookie is a small data file that we transfer to your device. We may use “persistent cookies” to save your registration ID and login password for future logins to the service. You can configure your browser by changing its options to stop accepting cookies or to prompt you before accepting a cookie from the websites you visit. If you do not accept cookies, however, you may not be able to easily access all aspects of the Redbooth service and may need to manually enter user and password information. In the course of using the Service, we may collect personal information that can be used to contact or identify you (“Personal Information”). Personal Information is or may be used: (i) to provide and improve our Service, (ii) to administer your use of the Service, (iii) to better understand your needs and interests, (iv) to personalize and improve your experience, and (v) to provide or offer software updates and product announcements. If you no longer wish to receive communications from us, please follow the “unsubscribe” instructions provided in any of those communications. Some browsers allow applications to access real-time location-based information (for example, GPS). Our mobile apps do not collect such information as of the date this policy went into effect, but may do so in the future with your consent to improve our Services. Redbooth will not be able to decrypt any files that you encrypted prior to storing them on Redbooth. We also collect some information (using third party services) using logging and cookies. We use this information for the above purposes and to monitor and analyze use of the Service, to increase our functionality and user-friendliness. As of the date this policy went into effect, we use Google Analytics and Intercom. Redbooth will retain your information for as long as your account is active or as needed to provide you services. If you wish to cancel your account or request that we no longer use your information to provide you services, you may delete your account. We will try to delete your information quickly upon request. Please note, however, that there might be latency in deleting information from our servers and backed-up. We go to great effort to make our Redbooth products as secure as possible, however if you have discovered a security vulnerability in Redbooth we would appreciate your help to disclose this to us in a responsible manner. In order to do so please send an email to security@redbooth.com explaining the issue and provide detailed steps on how to reproduce the vulnerability. Redbooth is subject to oversight by the U.S. Federal Trade Commission. JAMS is the US-based independent organization responsible for reviewing and resolving complaints about our Privacy Shield compliance — free of charge to you. We ask that you first submit any such complaints directly to us via privacyshield@redbooth.com. If you aren't satisfied with our response, please contact JAMS at https://www.jamsadr.com/file-an-eu-us-privacy-shield-or-safe-harbor-claim. In the event your concern still isn't addressed by JAMS, you may be entitled to a binding arbitration under Privacy Shield and its principles. Within the scope of our authorization to do so, and in accordance with our commitments under the Privacy Shield, Redbooth will provide individuals access to personal data about them. Redbooth also will take reasonable steps to enable individuals to correct, amend, or delete personal data that is demonstrated to be inaccurate. Redbooth uses a limited number of third party providers to assist us in providing the Services to our customers. These third parties may access, process or store personal data in the course of providing services like hosting services and marketing automation, but based on our instructions only. Redbooth may disclose personal data when we have a good faith belief that such action is necessary to: conform to legal requirements or to respond to lawful requests by public authorities, including to meet national security or law enforcement requirements; or to enforce our contractual obligations. Redbooth is responsible for the processing of personal data it receives, under the Privacy Shield Framework, and subsequently transfers to a third party acting as an agent on its behalf. Redbooth complies with the Privacy Shield Principles for all onward transfers of personal data from the EU and Switzerland, including the onward transfer liability provisions. This website, like many others, uses small files called cookies to help optimize your experience. ‘Cookies’ are small text files that are stored by the browser (for example, Google Chrome or Safari) on your computer or mobile phone. They allow websites to store things like user preferences. You can think of cookies as providing a ‘memory’ for the website, so that it can recognize you when you come back and respond appropriately. When you use Redbooth, we may send one or more cookies to your computer to uniquely identify your browser and let Redbooth help you log in faster and enhance navigation through the site. A cookie may convey anonymous information to us about how you browse the Service. A persistent cookie remains on your hard drive after you close your browser, so that it can be used by your browser on subsequent visits to the Service. A session cookie is temporary and disappears after you close your browser. Every time someone visits our website, software provided by another organization generates an ‘anonymous analytics cookie’. These cookies can tell us whether or not you have visited the site before. Your browser will tell us if you have these cookies and, if you don’t, we generate new ones. This allows us to track how many individual users we have, and how often they visit the site. Unless you are signed in to Redbooth, we cannot use these cookies to identify you or any other individuals. We use them to gather statistics, for example, the number of visits to a page. If you are logged in, we will also know the details you gave to us for this, such as your username and email address. For example, when you like Redbooth using the Facebook like button on redbooth.com, the social network that has created the button will record that you have done this. It is usually possible to stop your browser accepting cookies, or to stop it accepting cookies from a particular website. However, some features of our service may not function properly if you disable accepting cookies. All modern browsers allow you to change your cookie settings. You can usually find these settings in the ‘options’ or ‘preferences’ menu of your browser. To understand these settings, you can use the ‘Help’ option in your browser for more details. Redbooth Data Backup enables you to back up your data whenever you want. A couple of clicks and you can download a compressed folder with all your tasks, task lists, conversation, notes and links to file. Go to the Redbooth Data Export in your User Profile Settings, or Organization settings pages. Click on link to download your data. This link is only valid for 48 hours, so we recommend you download right away. Redbooth was fortunate to have strict security measures in place prior to GDPR. This belief in data security allowed Redbooth to quickly address and improve any issues pertaining to GDPR. We are committed to our customers and vendors and will help them comply with GDPR as a processor of their data. Reviewed and strengthened our security infrastructure. Ensure any data that may be stored or processed is managed according to GDPR. Delete or anonymize analytics data of users after user’s deletion. We’ve self-certified under the E.U.-U.S. Privacy Shield frameworks to comply with data protection requirements when transferring personal data to between any data warehouses in the US and EU. We have the appropriate contractual terms in place, to perfume our role as a data processor for our customers while complying with the GDPR. Renewed internal procedures, processes and controls and recurring training sessions for the team, to ensure our on-going compliance with the GDPR. Revised our Terms of Service. Added opt-in Consent to Cookies and Terms of Service on our marketing pages and during account creation. Both our newsletter marketing and account creation require a double opt-in through email verification before a user’s email in stored in Redbooth. Delete user (“Forgotten”): Users can delete their personal information from Redbooth and their memberships within organizations. Admins can ‘hard delete’ users and their historical contribution from Redbooth organizations they manage. ‘Removed’ users are hidden from the organization, but their contributions and content still remains. Delete account (“Forgotten”): Admins can mark their organization for normal deletion of our servers, or request an expedited ‘hard delete’ for security purposes. User Export (“Portability”): Users can export their personal information held in Redbooth, and their activities in a standard file format. Organization Export (“Portability”): Organization Admins can export their organization’s historical data in a standard file format. The GDPR defines and distingue between two types of parties and responsibilities when it comes to collecting and processing personal data: data controllers and data processors. A data controller determines the purposes and ways that personal data is processed, while a data processor is a party that process data on behalf of the controller. That means that the controller could be any company or organization. A processor could be a SaaS, IT or other company that is actually processing the data on behalf of the controller. Redbooth is a Data Processor. 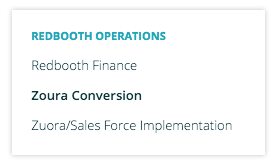 Redbooth customers (the organizations who use Redbooth) are Data Controllers. The controller is responsible to make sure that all processors with whom it deals will be GDPR compliant and the processors themselves must keep records of their processing activities. Click to view a pdf copy or request a signed copy . Do you have questions or require more information? Please contact us at security@redbooth.com.